New Menu with orders due March 5. Healthy Prepared Meals for delivery in the greater Topeka and Lawrence Kansas area. There is only one more menu after this one before our next week out of the kitchen, so be sure to stock up. Orders from this menu are due by 5 pm on Monday, March 5 for delivery in greater Topeka on Monday, March 12. Don’t miss the return of the Corned Beef & Cabbage on this week’s menu, just in time for St. Patrick’s Day! Everyone around here has sure been enjoying the nice weather. The chickens are out foraging under the Persimmons Tree, and the bees have found a little pollen from some early blooming Silver Maple Trees. It’s been a difficult year for our bees. We lost two hives in that really cold weather last month, and that’s going to mean that we need to purchase a few boxes of bees this year. Those two boxes of bees will cost over $300. To that end, we’ve decided to offer some of last year’s honey as an add-on to your normal order to help us pay for the replacement bees. 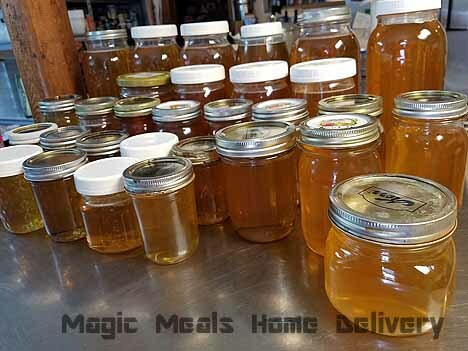 This is local honey from our backyard; this is the good stuff. We’re offering small jars and pint jars, and it’s extremely limited. Feel free to add it to your regular order, and order early. On a related note, the farmer we buy our local beef from also has local beef sticks that he sells. They are refrigerated beef sticks, as they are not made with lots of additives or preservatives. We and our kids love them, and we like knowing they are better quality than the shelf-stable, commercially produced version. If we offered these beef sticks as an add-on to your regular order, do you think you might be interested? Don’t forget that the Muffins are back! Keep checking out the FAQ on the website. It continues to grow and mature. If you have suggestions for questions and answers, be sure to let us know!